This week I received a new book in the mail! 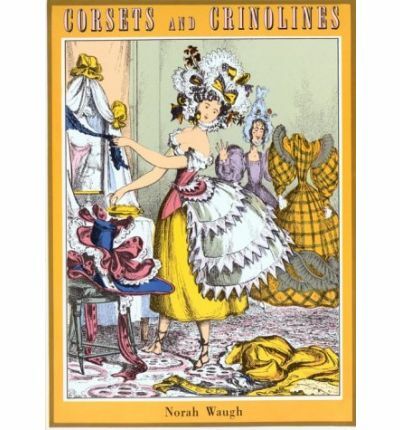 Corsets and Crinolines, by Norah Waugh, was first published in 1954, and has been invaluable to costumers ever since. I have been desperate to get a copy for ages and I finally made the plunge for my birthday! The book has some photos of extant undergarments, as well as some patterns drawn from extant undergarments. It also contains quite an amount of text describing the fashions of particular historical eras, and the inclusion of historical texts that mention particular aspects of clothing. As I was perusing it last night in bed, I came across a very interesting quote by a Spanish monk, Fray Fernando de Talavera, in 1477. It concerns the alarming fashions of women of the day, who were seeking to make their bodies altered in appearance by the use of whaleboned bodies and farthingales. 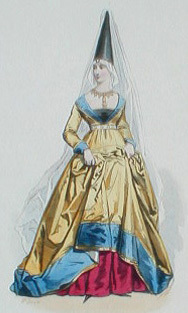 Women’s fashions at the end of the 15th century changed from the long, thin style of medieval dress, and began to become bigger around the bottom of the dress. This picture is a female Parisian in 1450. And, of course, just in case no one listens to such sage advice, it is always advisable to try and do everything to make such fashions morally wrong. Thus it is a sin when women who are small of stature wear chopines [see picture] to feign a height they do not possess, especially as Our Lord has willed it that women are usually short of body and smaller than men, since they have to be ruled by them as their superiors, or when they with rags, wool, petticoats or hoops, affect a width which they do not possess. There is no doubt that deception and lies are a mortal sin when carried out in the above evil and sinful manner; thus the padded hips and hoop skirts are very harmful and very wicked garments; with reason they have been forbidden under pain of excommunication. 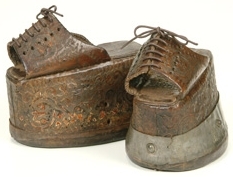 These chopines are dated to 1550, and were initially designed to enable the wearer to keep out of the mud. However, by 1600 the height of the shoes had risen to 20 inches! I am sure the poor monk has briefly forgotten in what other circumstances deception and lies are a mortal sin, especially when carried out in an evil and sinful manner… Indeed, I can think of many medieval examples! At every step of history, fashion excesses have been either denounced from the pulpit or ridiculed in the press. And I have always wondered why. I wonder if it might be an indication of how threatening change was to these people we read about in history. And when you think about it, people haven’t changed all that much! Think about how it feels when your boss proposes radical changes in your workplace… We are still all a bit resistant to change. It makes for very interesting reading! Picture Source: Chopines of Tooled Leather, c. 1600 – with lots of other images of chopines as well. Shakespeare is the author of over 150 sonnets, first published in 1609. 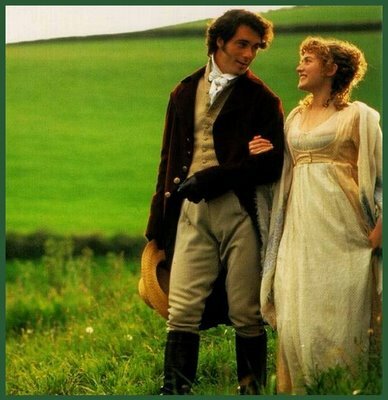 My first introduction to the sonnets happened when I watched the 1995 movie of Sense and Sensibility, starring Emma Thompson and Kate Winslet. Marianne Dashwood, the younger of two sisters, is a passionate girl with great sensibility, and has a great love of passionate poetry! My favourite is, without doubt, number 116. Whose worth unknown, although his height be taken. This sonnet talks about the nature of love, saying that love does not change, even when it finds changes in the one that it loves. Love is constant and never shaken. Love is likened to the guiding North star that ships used to estimate their position and direction. This star does not change position in the sky, and can therefore be relied upon to be constant. Love will not be made a fool of by Time. Even though Time, like a harvester, brings his sickle to cut down and age youthful attractiveness, Love will not alter and instead bears it all despite the difficulties. The sonnet, by way of conclusion, declares that if these truths about Love are proved to be error, then no man has ever loved before (which they clearly have). The interesting thing about this sonnet, in the context of the movie, is that it represents the perspective of Marianne Dashwood perfectly. She believes love should be passionate and true to itself. Love should be constant and unwavering. It should be strong enough to bear all difficulties encountered in life. Yet her first experience of love in her life, with Mr Willoughby, is quite different. He is initially all she could dream a suitor to be. He is handsome and rich, but what is even more important to Marianne is that he is passionate and does not hide his affection. When Willoughby is suddenly disinherited by a rich aunt, and having some very large existing debts, he is forced to reevaluate his love in the face of poverty. He sacrifices his love for Marianne – who has no dowry – to pursue marriage with Miss Grey and “her 50,000 pounds”. Marianne is devastated. Her idealogical view of love has been pitted against the realism of life with the attractiveness of wealth and advantage and has come a miserable second. However, despite her pain she rallies again and her passionate, wild, giddy love passes to one side, as she realises that Willoughby’s love was not really true at all. A more mature love takes its place within her; one that is calm and content; sober and soothing; reflective and restful. She marries the sedate, but chivalrous, Colonel Brandon. So what is true love? Shakespeare’s sonnet seems to suggest that true love is of the realm of the divine, of heavenly substance, and hardly humanly possible. Is it attainable at all? Marianne seemed to think so. 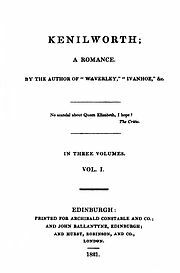 Kenilworth is a historical romance novel written by Sir Walter Scott, and was first published in 1821. It is set in 1575 in England, during the reign of Queen Elizabeth I. The story opens in an inn located in a village called Cumnor, Oxfordshire. A young traveller, Tressilian, is secretly looking for a woman, Miss Amy Robsart, to whom he is betrothed. He overhears a story about a beautiful woman secluded in a house in the neighbourhood, Cumnor Place, and there he finds his betrothed living there as a prisoner, but she refuses to escape with him. As he is leaving, Tressilian comes upon Richard Varney, who had been attending on Amy’s father before she disappeared, and Tressilian supposes that Varney must have kidnapped her from her father’s house to be his mistress. Tressilian arrives at Sir Hugh Robsart’s house where they decide that the best thing to do is bring the matter before Queen Elizabeth. The Queen’s favourite is the Earl of Leicester, and it is known that Varney is in his employment. On route to the Queen in London, Tressilan gets word that his friend Earl of Sussex is not well, and he rushes to his side. The Earl of Sussex is also a favourite of the Queen, and is a fierce rival to the Earl of Leicester, who is Elizabeth’s preferred. Sussex hears of Tressilian’s plan to plead the case to the Queen and supports him, hoping that the revelation may damage Leicester’s standing with the sovereign. Unknown to Tressilian, Amy Robsart has actually secretly married the Earl of Leicester, and NOT Richard Varney. Tressilian gains an interview with the Queen, where he accuses Varney of kidnapping Amy and holding her against her will, but Varney claims that there has been a legal marriage. The Queen then suggests that Leicester hold a royal party at his seat in Kenilworth, and that Amy attend so that she may see the new bride. The Earl of Leicester is beginning to lament his hasty decision to marry Amy Robsart. The Queen is very attached to Leicester and the rumour is on everyone’s lips that they will marry. Varney is also regretting the Earl’s marriage, as his ambition is to climb as high as he can on the back of Leicester, hopefully being able to eventually influence him as King. They decide to try and persuade Amy to attend the revellings under the pretense of being Varney’s wife. Varney travels to Cumnor Place with a letter from Leicester, telling Amy to attend the Kenilworth party as Varney’s bride. She is incensed, believing that Varney is lying and is not doing the will of Leicester, and then becomes afraid for her safety when her guards try to poison her. Her maid, seeing the mortal danger Amy is in from those men guarding her, helps her escape in the middle of the night with Tressilian’s servant, and they decide to travel directly to Kenilworth to plead her case with her husband, rather than going to her father’s house. They manage to gain admittance to the castle under the guise of entertainers, and Amy – secluded secretly in Tressilian’s chamber – writes a letter to Leicester, imploring his help. The letter is stolen from the servant before it can be delivered, and the servant is accidentally evicted from the castle grounds. 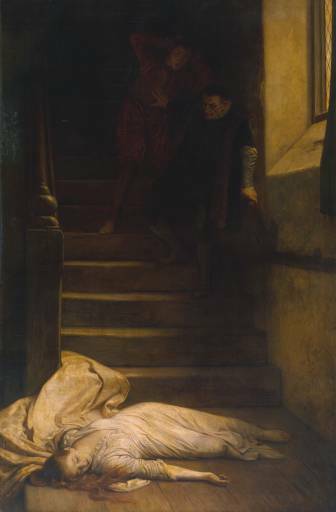 Tressilian, happening upon Amy in his chamber, is forced to promise not to intervene on her behalf for 24 hours, which closes all the avenues by which she can seek help. The Queen arrives at the castle with all of the pomp and grandeur necessary, but the Earl of Leicester does not appear in Amy’s quarters, as he does not know she is there. The next morning she leaves her room and hides herself in a square within the grounds where Queen Elizabeth happens upon her. Amy is very anxious, as she does not want to betray her husband, yet she is afraid for her life. Elizabeth takes her before Leicester and demands the truth, but Varney intervenes, saying his “wife” is mad. Amy is confined in a room to calm down, and Leicester goes to visit her secretly with Varney. She pleads with the Earl to reveal her real identity to the Queen and, after seeing her emotional plea, Varney realises that, for his ambitions to succeed, she must die. Just as Leicester decides that he must tell Elizabeth everything, Varney suggests to him that his wife has not been faithful to him and has continued her attentions to Tressilian, despite being married. Leicester is passionate with rage and decides that his wife should be returned to Cumnor and punished to the point of death for infidelity. Varney leaves Kenilworth with Amy later that night, before Leicester has an opportunity of relenting of his anger. That night Leicester confronts Tressilian about Amy and they fight a duel. Just as Leicester is about to slay Tressilian, they are interrupted by the boy who had stolen Amy’s letter, as he had been endeavouring to deliver it to the Earl himself. Leicester reads the letter, which communicates the perils with which Amy had travelled to be with him, and he begins to see that she was faithful to him, despite what Varney led him to believe. He rushes to Elizabeth to confess his marriage to her and then sends Tressilian to Cumnor Place to ensure Amy is safe. Meanwhile, Varney had rigged a trap on the landing at the top of the stairs so it would give way as soon as she stepped on it. When she did not attempt to escape her chamber, he went outside and imitated Leicester’s secret whistle so as to lure her from her room. She came rushing out at the sound and fell to her death. The novel was intially quite hard to read, as it waffled on about seemingly irrelevant details and was full of thees, thys, thous, comeths, and goeths. But when I discovered that the novel was based on a true story my interest was rekindled! The plot is based on the true story of Robert Dudley, the first Earl of Leicester. He was the favourite of Queen Elizabeth, so much so that it was suspected he would marry her. As in many reproductions of “the truth”, Sir Walter Scott has taken some liberties with the facts in his novel. Amy Robsart married Robert Dudley in 1550 and not in secret, as King Edward VI attended the wedding. She actually died in 1560 (not 1575) from falling down a flight of stairs at Cumnor Place. She was also suspected of being ill with a “malady in her breast”, possibly breast cancer. The coroner’s inquest concluded it had been accidental, although there was much suspicion that Dudley had orchestrated the death with the intent to marry Elizabeth afterwards. Sir Richard Varney was the only person at Cumnor Place the day that Amy died, as everyone else had gone to a local fair, which caused some suspicion of foul play at the time. A publication, Leicester’s Commonwealth, of disputed authorship, was published in 1584, and accused Dudley of murder and many other wicked deeds and it greatly affected his reputation. The suspicion and unrest around the death of Dudley’s wife was one of the reasons Queen Elizabeth did not marry him. 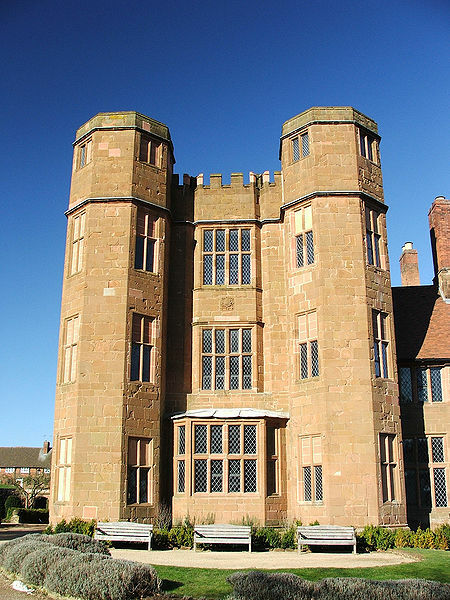 However, she granted him the castle at Kenilworth in 1563 and also gave him the title of Earl of Leicester in 1564. The royal party at Kenilworth was held in 1575, but Amy Robsart had already been dead 15 years. As to the other main character of the book, Tressilian seems to be a mere invention of the author’s imagination. In my volume, the author has explained the origin of almost all the other incidental characters and their involvement in the history of this event, but Tressilian remains a mystery. 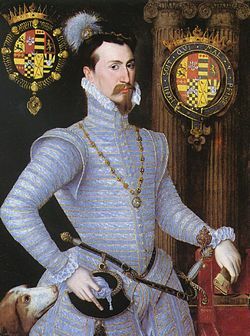 Robert Dudley did remarry eventually, to a widow named Lettice Devereux (maiden name, Knollys). They married secretly in 1578, but Elizabeth found out soon after and was very angry. Her jealous reputation came to bear and she refused to allow his new wife to come to court. There is still much debate over whether Robert Dudley actually murdered his first wife. Unfortunately it is difficult to tell the facts from the fiction! Did Robert Dudley murder Amy Robsart? – a website exploring many aspects of Elizabeth’s 1 life. 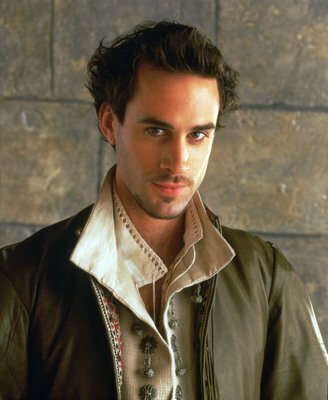 Elizabeth – the movie (1998), where Joseph Fiennes stars as Robert Dudley.